3D Hologram Projector displays holographic video at trade show. 3D Hologram Projectors are a very exciting way to attract attention to your trade show booth. Trade Show Holograms has created a series of holographic projectors that can offer visitors to your trade show exhibit a 3D presentation without the use of special 3d glasses. The displays are available for both rental and for purchase and have proven quite popular with past clients including Boeing, Flexco, GE, HP, Northrop Grumman and others. Trade Show Holograms now also offers life sized holographic displays that allow a full sized virtual presenter or spokesperson to appear in 3D rather than the flat 2D virtual presenters currently on the market from other companies. Fiona is an example of that new display. Hologram Projector displays 3D images for trade shows. Trade Show Holograms debuts a holographic robot exhibit. Trade Show Holograms has recently developed a series of large scale hologram exhibits featuring holographic trade show robots. Currently two virtual robot presenters are available for rent and sale in the US and Canada. The first is Fiona and the second is her male counterpart, Victor. Both are amazing visuals and eye catching displays sure to attract attention wherever they are displayed. The 3D holographic projections offer trade show exhibitors something exciting to draw attention to their booth. Here Victor is seen giving a presentation to visitors at the Annual BrainSTEM festival held at the Perimeter Institute in Kitchener Waterloo , Ontario Canada. 3D Holographic Robot attracts attention at Science Exhibit. 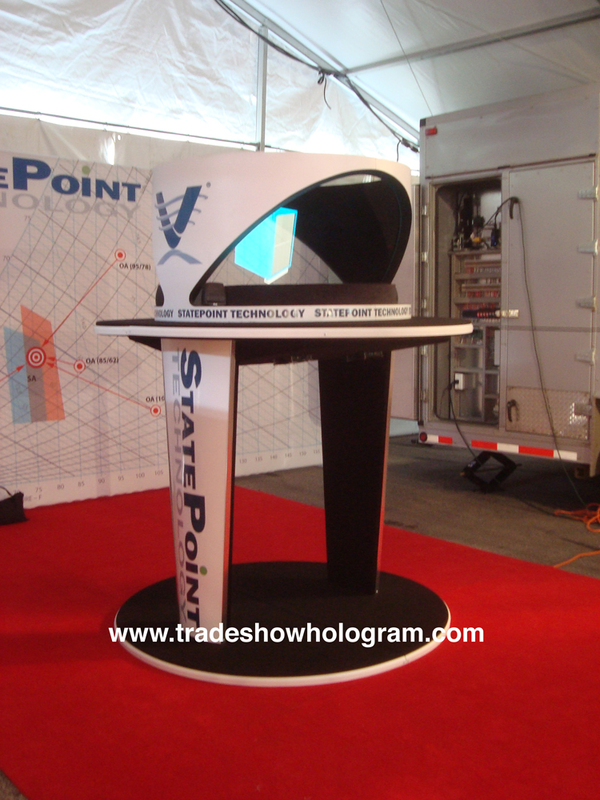 3D Holographic Virtual Presenter for Trade Show Exhibits in the USA and Canada. With Virtual Presenters and Promoters becoming popular with trade show exhibitors in the USA and Canada, Trade Show Holograms has developed a new attraction that addresses the problems of standard Virtual Presenter Exhibits. 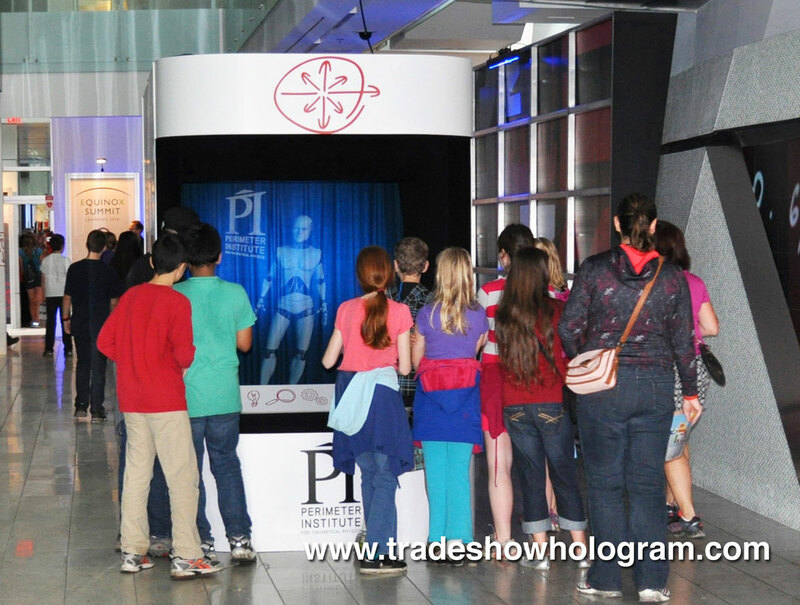 Fiona is a life size holographic 3D projection sure to amaze visitors and attract crowds to any trade show booth. Standard Virtual Presenters are limited to a frozen pose and cannot move. They are videos being projected on to a cut out screen and only face expressions and very slight hand movements can be achieved. Fiona has a full range of movement, front back, side to side, 360, can move all her appendages in a natural range and is not limited to the boundaries of a silhouette cut out form. She can also change shapes and size as well as morph into any other virtual model of the clients choosing. The standard virtual presenter is also a very 2d projection as it has no depth or 3rd dimension appearance. Fiona appears as a stunning 3D image without the need of any special glasses. 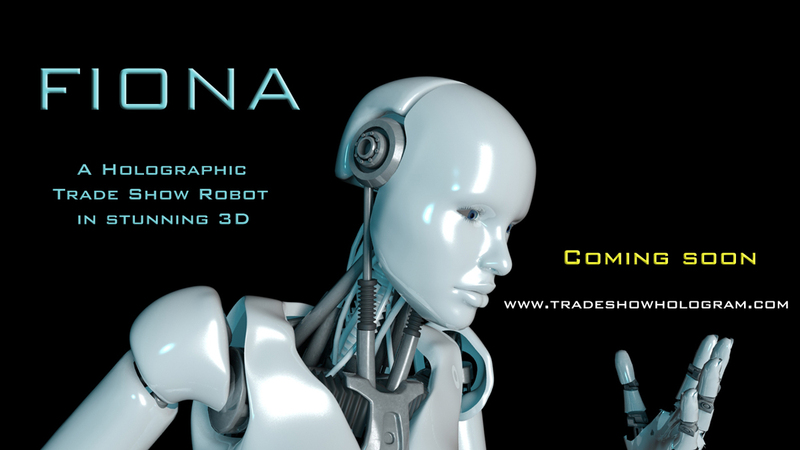 A standard virtual presenter is most often a recording of a sales person ( human ) and does not come across to a visitor as unique while Fiona is a Fembot ( Female Robot ) who’s very appearance is futuristic and very interesting to a trade show booth visitor. Fiona is available for rental in early fall of 2013. Fiona is a 3D Hologram Projection and Virtual Presenter. Introducing Fiona. 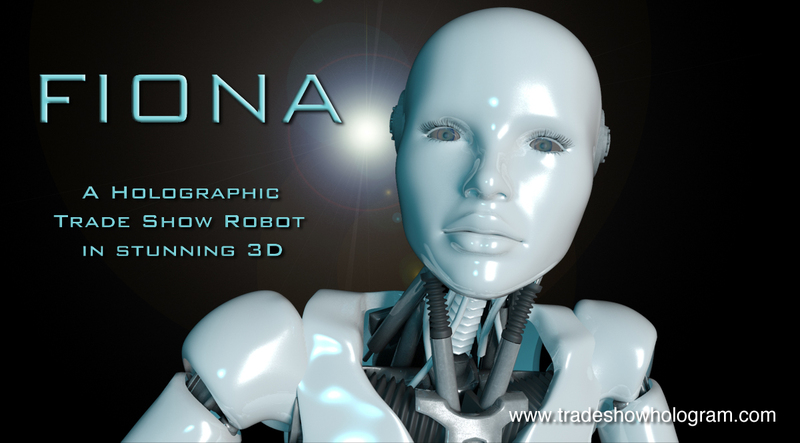 Fiona is a life sized holographic robot that beams into your trade show booth and presents your message to trade show attendees. Her futuristic design features a metallic finish that can be any colour of your choosing. She is featured as a 3D Holographic projection who can not only act as a virtual spokesperson but also morph herself into a holographic version of your product. Fiona enlists the help of multiple other visual effects to present something truly amazing. Visitors to your trade show booth will be mesmerized by this stunning 3D visual demonstration. Fiona is a creation of Trade Show Holograms and is available for trade show rental in both the US and Canada. Life sized Virtual Presenter appears as 3D Holographic Avatar on stage via teleconference. No its not Princess Leia of Star Wars fame but rather a life sized 3d holographic virtual presenter speaking via teleconference at the ASE 2013 conference in Minneapolis MN. Dr. Partho Sengupta is seen here speaking with a holographic version of his mentor Jim Seward to discuss the future of high tech computers in the medical profession. 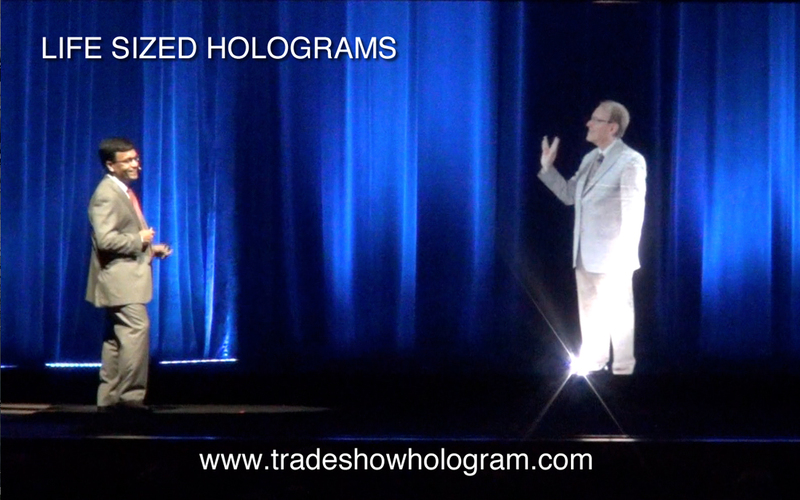 Trade Show Holograms, a company that develops both large and small holographic presentations in North America created the special presentation in a way that it could be viewed in 3d without the use of any special 3d glasses. The company offers a series of holographic projectors for both sale and rental in the USA and Canada. Virtual Presenter appears on stage as a 3d holographic avatar.